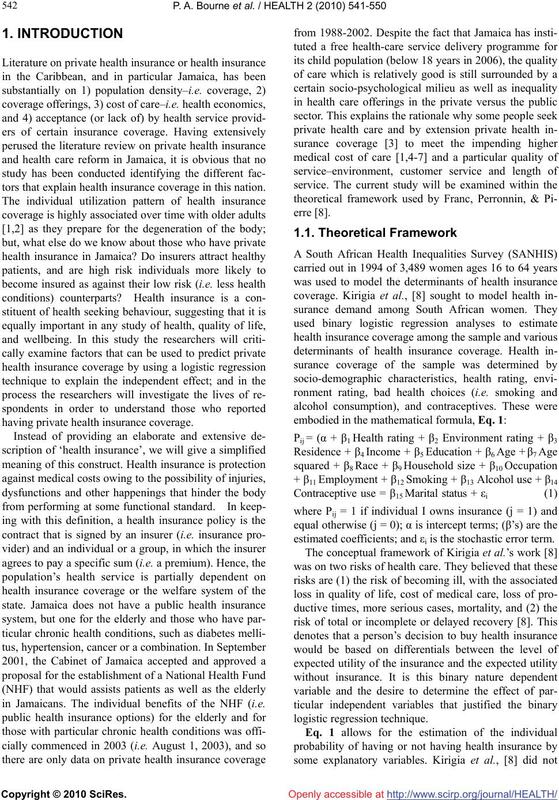 Received 18 November 2009; revised 5 January 2010; accepted 8 January 2010.
of health insurance coverage in this sample. tors that explain health insurance coverage in this nation. having private health insurance coverage. in Jamaicans. The individual benefits of the NHF (i.e. estimated coefficients; and εi is the stochastic error term. living arrangements of person i; and CRi is crowding. force, and this was for the Survey of Living Conditions. for the first time, and omitted in subsequent surveys. This is the average number of persons living in a room. years lived, which is also referred to age at last birthday. years. Age group is classified into three categories. ance coverage and 0 is otherwise. denote greater ownership of durable goods. living alone, 0 = living with family members or relative. whom one is able to network, 0 = otherwise). and income in this sample. Table 1. Demographic characteristic of sample by area of residence. Table 2. 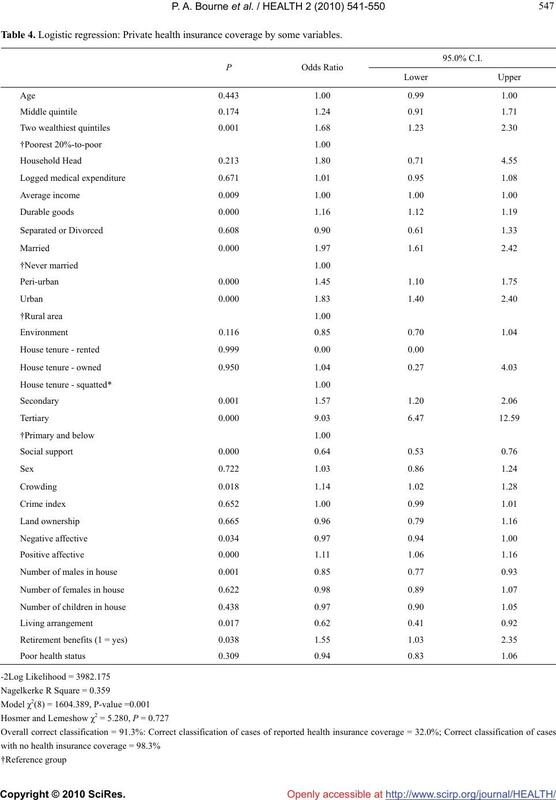 Good health status by social standing (Per capita population quintile). Table 3. 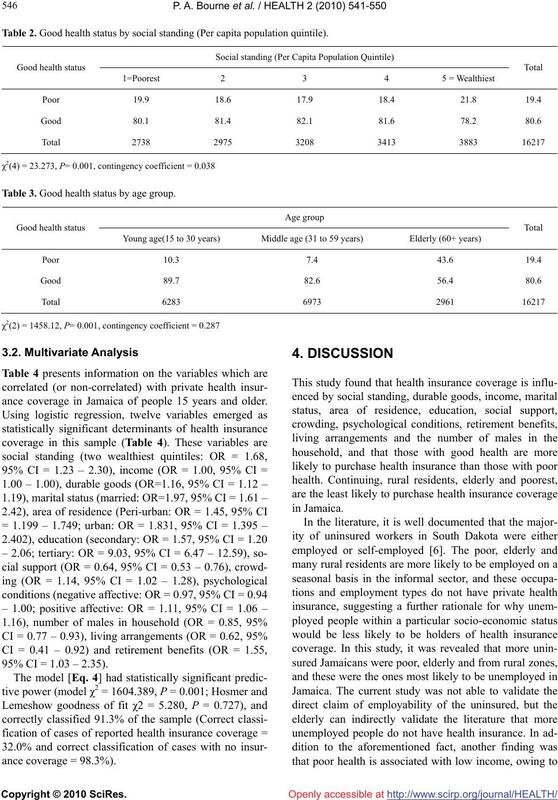 Good health status by age group. 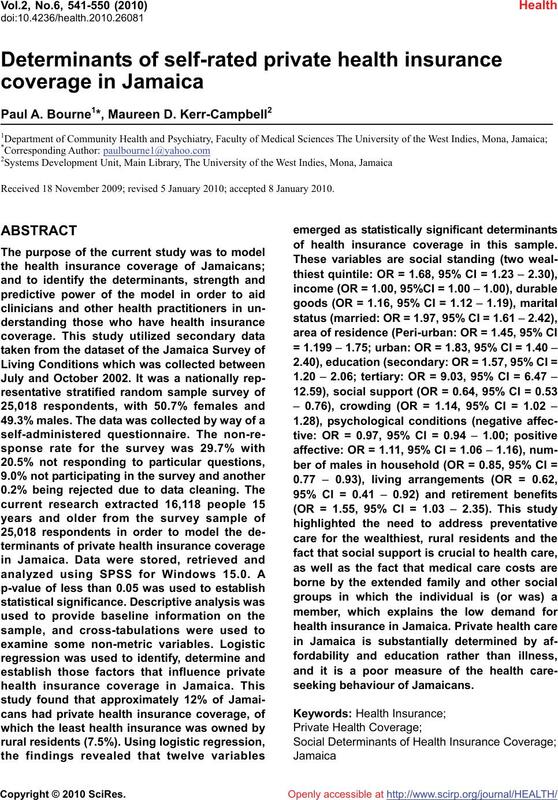 ance coverage in Jamaica of people 15 years and older. 95% CI = 1.03 – 2.35). Table 4. 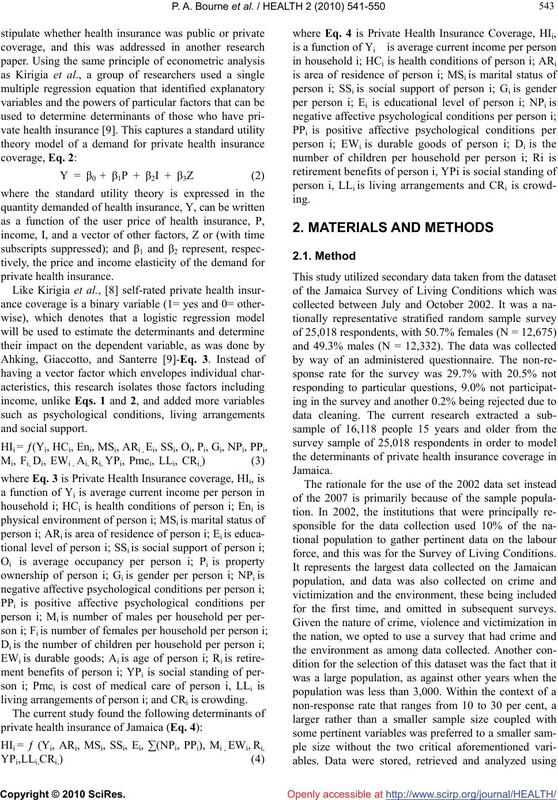 Logistic regression: Private health insurance coverage by some variables. have more health-related conditions than the wealthy. poor, justifying why they reported the least health status. 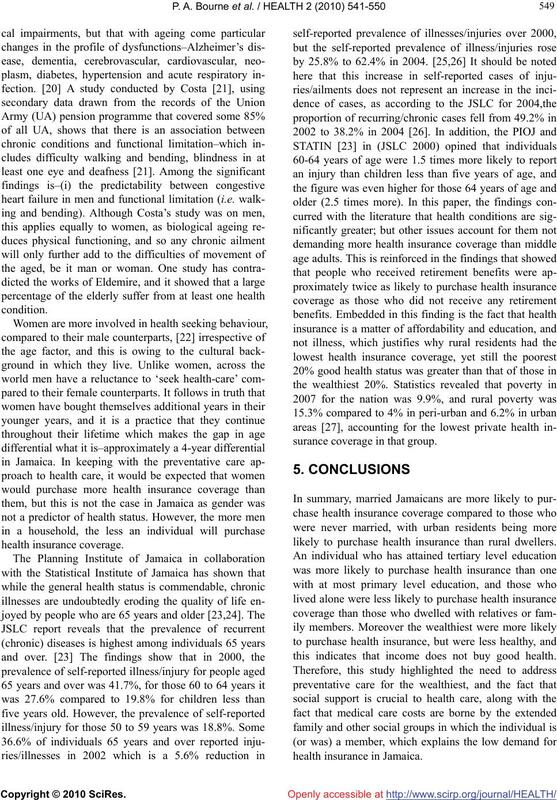 between self-rated health insurance coverage and income. nomic circumstances of the individual. the thinking is that money can buy health. proximately 2 middle aged adults and 4 elderly persons. ferent stage from other age cohorts in a population. surance coverage in that group. 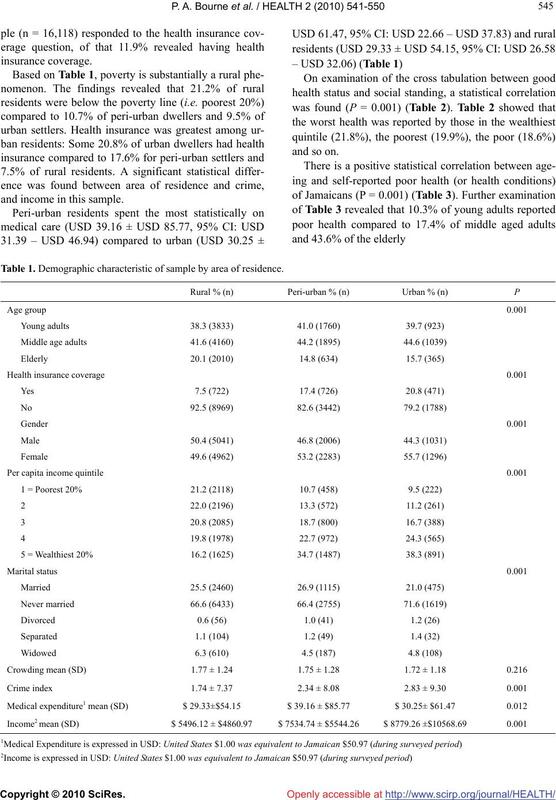 likely to purchase health insurance than rural dwellers. this indicates that income does not buy good health. 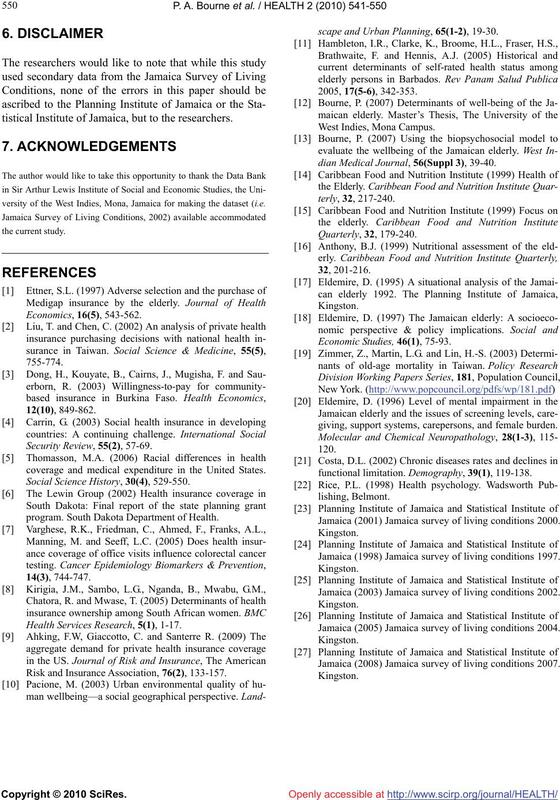 tistical Institute of Jamaica, but to the researchers. versity of the West Indies, Mona, Jamaica for making the dataset (i.e. coverage and medical expenditure in the United States. Social Science History, 30(4), 529-550.
program. South Dakota Department of Health. 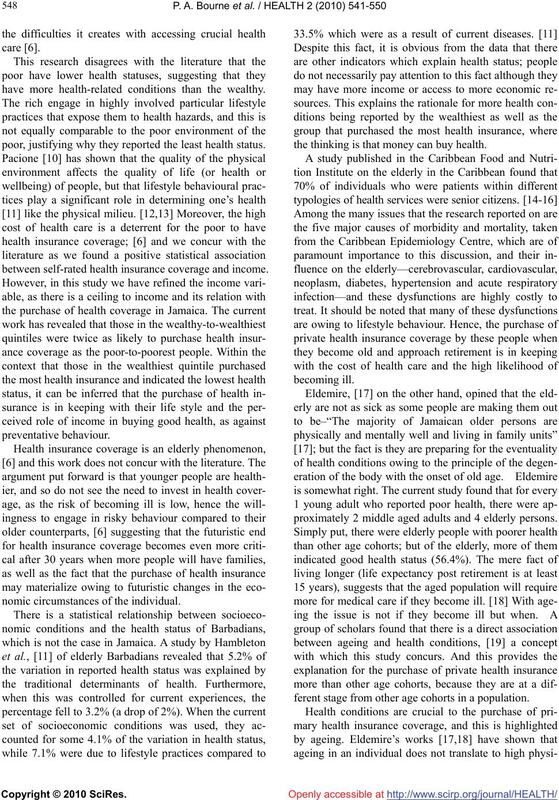 Health Services Research, 5(1), 1-17. Risk and Insurance Association, 76 (2), 133-157.
scape and Urban Planning, 65(1-2), 19-30.
giving, support systems, carepersons, and female burden. functional limitation. 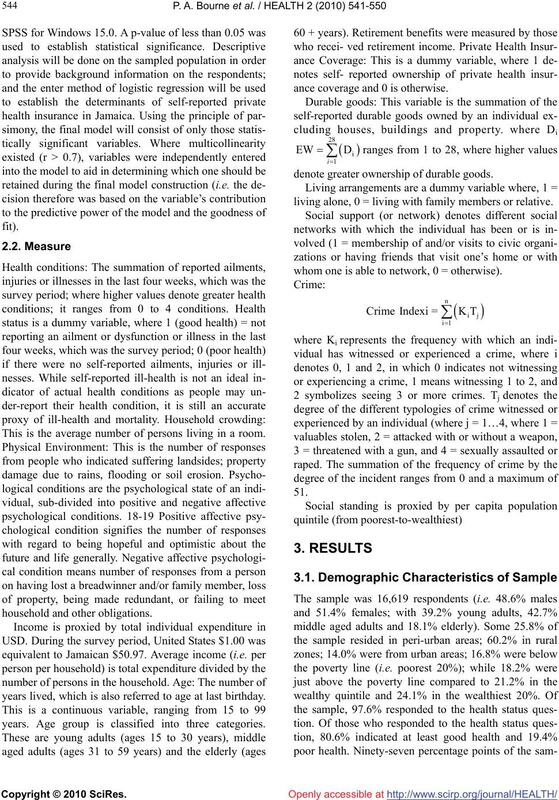 Demography, 39(1), 119-138. Jamaica (2001) Jamaica survey of living conditions 2000. Jamaica (1998) Jamaica survey of living conditions 1997. Jamaica (2003) Jamaica survey of living conditions 2002. Jamaica (2005) Jamaica survey of living conditions 2004. Jamaica (2008) Jamaica survey of living conditions 2007.